Stress and anxiety are part of daily life and it is something that we take great joy in effectively helping our patients deal with. So many different things lead to stress- work, health, finances, children and family life, to name a few. And as many parents and guardians out there know, adults aren’t the only ones suffering from anxiety and stress- our little ones feel it too! We wanted to provide a little information to the parents out there about how to help your kids cope. Many children suffer from anxiety, fears, phobias and other psycho-emotional conditions. Anxiety can take on various manifestations and can also be triggered by large and small life events- a move to a new home or school, change of routine, loss of a parent or loved one (even a pet), illness or recovery and beyond. Just think of the excitement that comes in early September at the onset of a new school year, how vividly we remember picking out new notebooks for school or the first day of school outfit. Giddy anticipation, sure, but also a twinge of nervousness and anxiety. Many people are surprised when they learn that children and even babies can receive acupuncture. We find that children’s response can sometimes be almost immediate- perhaps because they don’t have a lifetime of “bad” habits behind them already. Ahem, like working long days, late nights celebrating with friends, or living off of cereal in college. One reason why ear acupuncture is so useful is because it can be taught to the parents/guardians of the child. 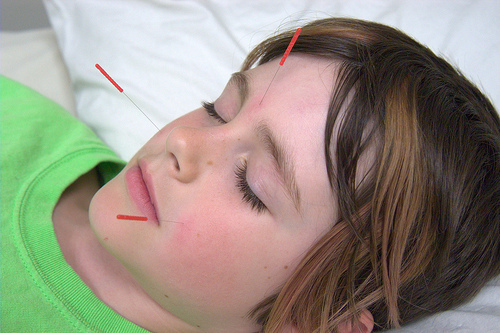 Needles are used only by a licensed acupuncturist, however the child can be sent home with ear seeds, which can prolong the treatment effects. Additionally, ear seeds can be extremely beneficial because they can be used by the parent in a “as needed” or “preventative” method. My dear sister and mother of four has been using ear seeds at her home with her children- and has gotten great results. Her 10 year old will even ask her for the “ear thingys” when he is feeling nervous about a swimming contest or new friend’s birthday party. We worked together to come up with the best points for each of her children, and she swears by them!